• Expressions are now created using double quotes for strings instead of single quotes. This is a work around for a bug in After Effects when renaming items. • NNew nice vector controllers, instead of nulls. Old behaviour with null objects can be restored in the settings panel. 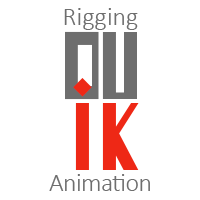 • Better one-layer IK: FK over IK and weight. Autorig : “Undo group mismatch”. Wiggle : Wiggle on the position of 2D layers. Some tools didn’t work when there was locked layers in the comp: fixed! Undo/Redo with the autorig entered an infinite loop and freezed After Effects: fixed! New option for the size of the bones and controllers so they automatically adapt to composition size, the user choosing its preferred size: small, medium, big. IK: when the user does not correctly select the layers, Duik warns the user but still tries – and fails – to create the IK. User Interface: On AFX CS4, the texts on the buttons are white on a light grey background, which makes them difficult to read. “Interpolations” tool is now integrated as a new panel on the main Duik UI. Bugfix : morpher does not anymore create an expression on itself. Bugfix : bones are not anymore created out of place. “Links” tool upgraded : it can now easily link two properties using expressions, even on layers from two different compositions. New “interpolations” tool allowing you to easily manage keyframes types and their interpolations. An independant dockable panel for this “interpolations” tool. “Morpher” can now be applied on many properties in only one clic. “Spring” tool can now animate bouncing on a surface. Added preferences : language selection, update checking. New “lens” button which creates lens flares with user layers. IK on one bone upgraded, to allow rotation even if an IK has been applied (FK upon IK).